To please the budget phone lovers, Intex has launched it’s dual-core Android kitkat budget smartphone, Intex Aqua Desire with 8-MP+2-MP Camera, Smart Gasture and Mobile antitheft technology which is available in Indian market priced at Rs 5,550 in White, Blue, and Grey colour option. It will counter with Xiaomi Redmi 1S. The all new Intex Aqua Desire supports Dual-SIM(GSM+WCDMA) with Dual-Standby, 3G, GPRS/ EDGE, Wi-Fi 802.11 b/g/n, Micro-USB, and Bluetooth comes with a 4.7-inch FWVGA IPS display with resolution (480×854 pixels) and colour depth 16.7m perfect for multi-tasking with superior wide-angle view. Intex Aqua Desire is powered by a 1.2GHz dual-core MediaTek (MT6572) processor with 512MB of RAM runs on latest Android 4.4 kitkat OS promising superior gaming environment reducing heats allows to runs your apps smoothly while 4GB internal memory and 32GB external memory offers enough space to store your azurite games, songs, movies and apps. Intex Aqua Desire offers you a 8-MP Autofocus Rear Camera with LED flash with Panorama Shot, HDR, voice capture, face detection feature perfect for shooting and low light photography and 2-MP front facing camera for clicking selfies and making video call. Intex Aqua Desire is powered by a 1700mAh battery offers you up to 240 hours standby time and up to 5 to 6 hours talk time including additional features like Auto Call Record, Super player, hide apps, smart wake up, smart gesture, DUAL FLASH, Mobile antitheft and pre-loaded apps like ASK ME, clean master, Flashlight, Intex fun, Intex market, Intex Play, Intex zone, Opera mini, OLX. 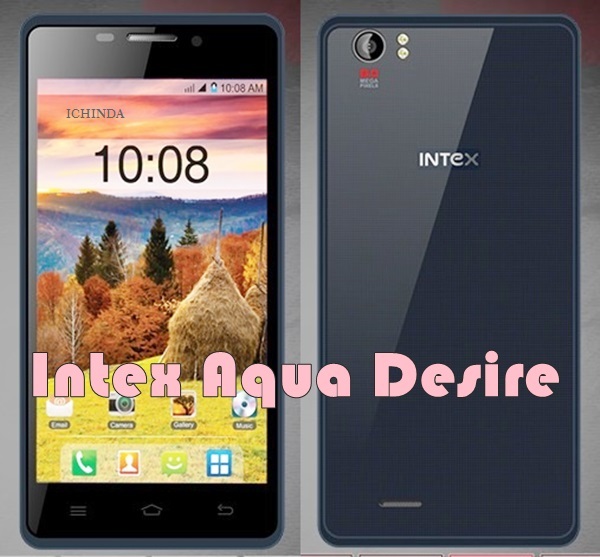 At last few honest word, Intex Aqua Desire is specially designed to counter Xiaomi in budget phone market. What you think? Please be first to write a review.